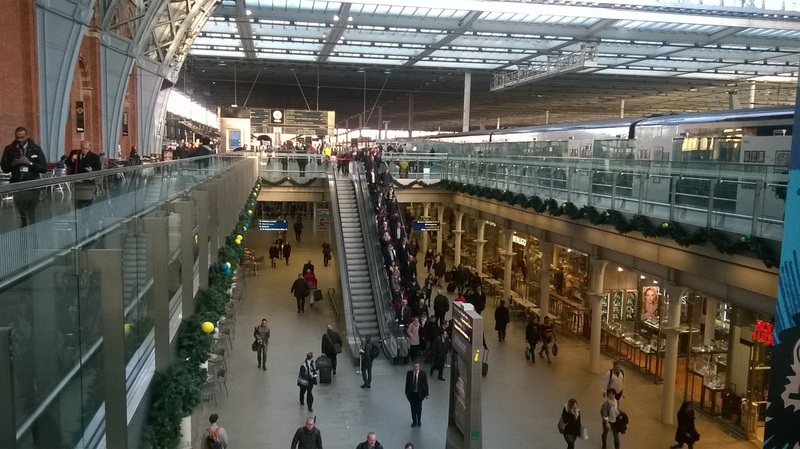 St Pancras is a very long station, on three levels. You have to walk for about 5 minutes from the front of the station to the platforms. 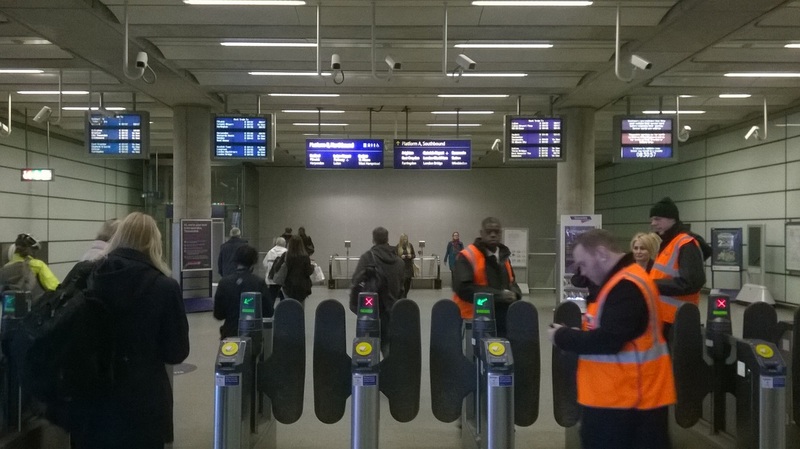 If you are travelling to Luton or Bedford, trains depart from two different places – one level above the main concourse, and one level below the concourse. So you need to make a decision about whether to go up or down to get the quickest train. These screens are dotted through the concourse, on all floors, so you can make an early decision to head upstairs or downstairs, which is great….but…. 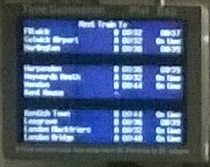 The bottom half of the display shows 8 trains, and it cycles between 2 pages to show the next 16 trains in total. The problem is that it changes from page 1 to page 2 only every 30 seconds. What the user needs at this point is a very quick piece of information about where to go, but it is designed so you may have to stand and watch the screen for up to 1 minute to get the information you need. This sort of screen works very well in airports, with a more regular screen changeover (Youtube videos show airport screens ‘changing over’ every 8-10 seconds). I think the reason for the long screen change time is because it has to wait for the long list of stops for each train to scroll right to left in full (in yellow in the picture). Its a terminus station, so this list is as long as it could be, and its a problem that airports don’t have. 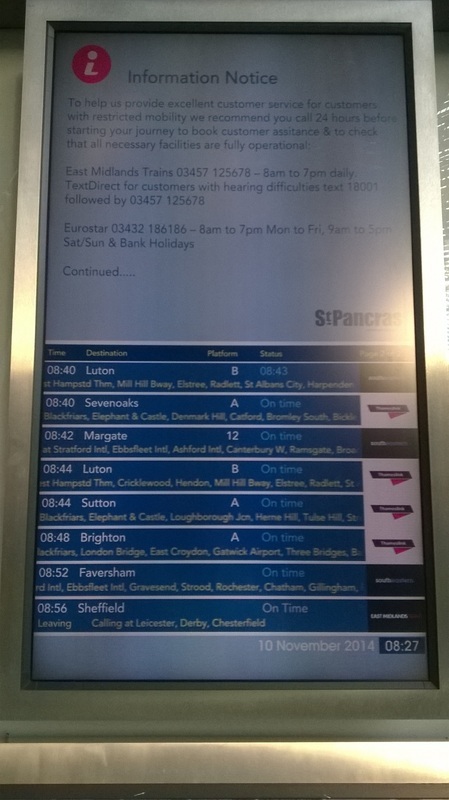 – Eliminate the page change – there is space to display all 16 trains on the screen at the same time. It could show all 16 trains for 50 secs, then the ‘information notice’ for 10 secs. 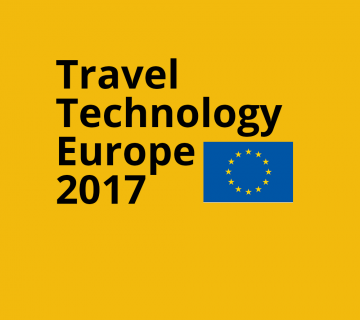 – Consider different screens altogether for northbound, southbound and eastbound trains – each person is only looking to go in one direction. 2. How do I get upstairs? The entrance to the platforms is in the distance in this picture, below the clock and big screens on the top floor. Several of the main entrances, and the main station departure boards are located directly below that – in the distance on the lower floor in the picture. When you arrive on a train, there are two ‘down’ escalators immediately after the ticket barriers, which you can see in the picture (they normally both go down, although one is broken today). So far so good, but what if I am departing from St Pancras, rather than arriving? The ‘up’ escalators are a fair distance behind the position where this photo is taken from, so the passenger has to come towards us on the bottom floor from the entrance, go up the escalator behind us, then go back along the top floor to the platforms in front of us. If someone is rushing to get the train, this is a frustrating extra distance between them and the train. There are stairs, but they are even further back, and point in the opposite direction to the escalator, so the top of the stairs are even further back. The entrance to the ‘Thameslink’ platforms does not list the trains and what time they depart, instead it has three screens that list all the possible stations you can go to in alphabetical and what time the train departs that will get you there fastest. Not a bad idea in some ways, but the screens are not next to each other, rather spaced out from left to right, so the user has to stop and work out which screen to look at for their station, then find their station in the list, which slows them down. And what if they don’t want to get the next train, but a later one to allow time to buy e.g. a newspaper or coffee? Walking outside of St Pancras, I am reminded of another piece of useless design, which has actually been improved in this case. Traditionally, for the whole of my life anyway, the green/red man indicator lived up high on the other side of the road (as in the right hand picture above). One day, this changed so that the indicator became part of the unit on the user’s side of the road where they press the button. 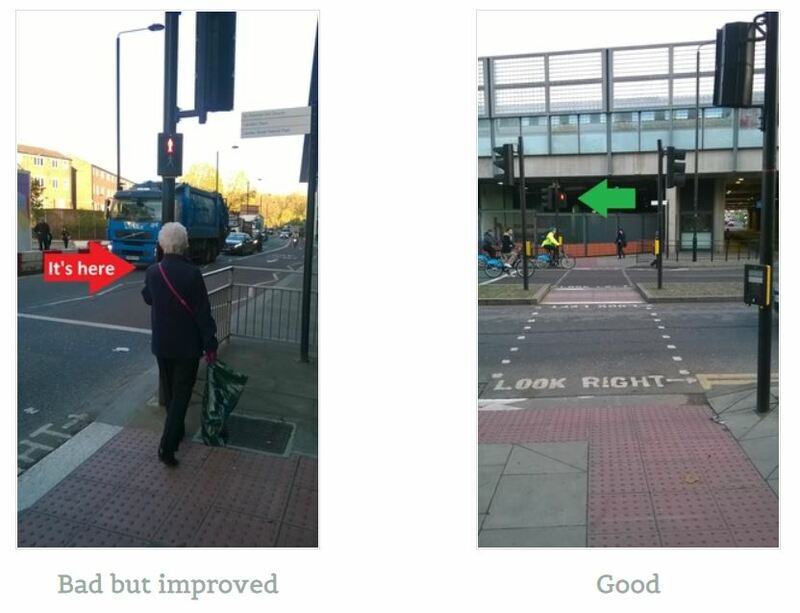 I assume they did this so that it forces the user to look at the oncoming traffic when looking at the green/red man, or to help short-sighted people, or perhaps for simple cost reasons as it reduces the amount of equipment needed. However, when someone stands in front of it (like in the left hand picture), you can’t see it at all. You simply don’t know when to cross the road, which is this equipment’s only purpose. This is a good example of where a very cheap and easy user test with multiple people would have uncovered this issue very quickly, rather than blindly committing to installing these all over the country. The immediate solution is they have put a second indicator further up the pole. I am an avid user of ‘Boris Bikes’, London’s shared cycle scheme, and generally it feels like a lot of attention has been given to the design of the bicycles themselves. However, the docking stations are much less usable. 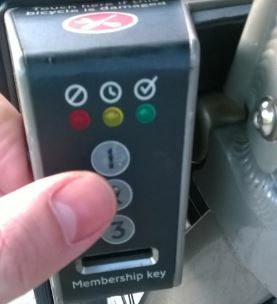 As a member I have a ‘key’, a sort of contactless pass you put in the slot to instantly release a bicycle. This could hardly be more usable. However, if you are a casual user, you have to do something complicated at the terminal with your credit card to retrieve a piece of paper with a five-digit code on it, made up of the numbers 1, 2 and 3. You then attempt to type the number into the key pad next to the bike, and this is where the problem starts. The buttons give the user no feedback at all, so you don’t know whether the machine received the instruction or not – they are completely flat, there is no physical sensation when you ‘press’ them, nothing lights up and no sound is made. You just have to trust the numbers are going in, but because the codes are made up of numbers 1, 2 and 3, unavoidable repetition in the codes means you can easily lose track of how far through the code you are, especially with a code like 13332. The result is that people think the buttons are broken and if the code is rejected, they press harder or use something sharp like their finger nails to try to depress the buttons. Hence the damage and in some cases complete destruction of buttons all over the network. – There are 3 LEDs directly above the buttons, why not show an amber light after each of the first four buttons is pressed, followed by either green or red after the fifth button to show the code is correct/incorrect. – The docking points are actually technically equipped to make a sound and sometimes do randomly (presumably for blind cyclists?! ), so a reassuring beep after each press would be helpful. 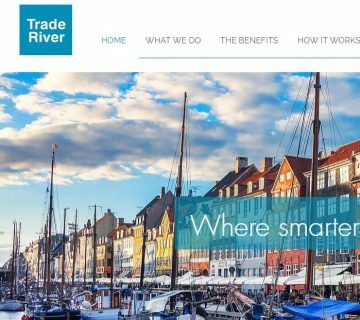 – Completely reconsider the process of paying and releasing the bicycle – perhaps a physical token system like a magnetic ticket rather than a code. Maybe the token could even be something useful like a helmet that you have to return after you have hired the bike. The task I was given was to identify things that I personally felt had usability issues in their designs. The first thing I want to add is that St Pancras Station, British road furniture and the Barclays Cycle Hire scheme are all generally very well designed and in fact celebrated examples amongst their peers, so it seems a bit mean to pick holes! The other thing, as I have had drummed into me during the Usability Week course, is that I am not a typical user (I am a business analyst who has just spent 2 days being taught about usability! ), so my feelings about these 5 things may or may not be representative of the results you would get from more neutral user testing. Let me know below how you feel about these issues if you have been to St Pancras, used a Boris Bike or ever crossed a road in the UK!